At first glance these look like the Stacy Adams Madison shoes in black until you realize that these are just a little bit different from the original Madison shoes that have been around for over 125 years. 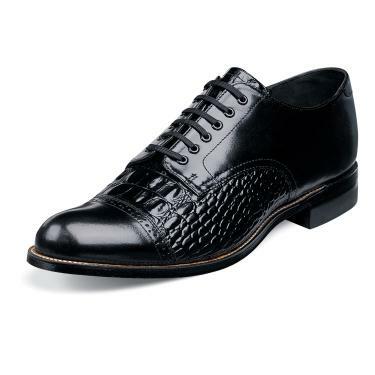 These Black Madison shoes are the classic style biscuit toe shoe that we all know and love but with the added style of crocodile print leather as well as the smooth buttery looking calfskin that your garden variety Stacy Adams Madison shoes are made of. This Madison by Stacy Adams features a combination of smooth calfskin cap toe upper with a sharp looking crocodile skin print inlay with genuine Goodyear Welt constructed full leather sole and heel with a rubber bottom making for a classic Madison style with a twist. Item ships in two business days.